ICT InteraCT is a new course delivering everything teachers and students need for success at Key Stage 3. The series combines digital resources with Student's Activity Books and photocopiable Teacher's Packs. ICT InteraCT is designed to help specialists and non-specialists alike deliver effective ICT to students at Key Stage 3.Placing an emphasis on relevant, scenario-based activities that promote problem solving through clearly levelled tasks, the resources provide: - A stimulating, scenario-based approach - Levelled assessments that are differentiated by task - Teacher's guidance on how to assess the levels and map the contents of the course to the revised Programme of Study, STUs, QCA Scheme of Work and other initiatives, such as Every Child Matters - Formative and summative assessment opportunities -- including interactive tests - Tasks that cover skills, knowledge and understanding to promote ICT capability - Truly integrated print and electronic content Powered by Dynamic Learning, the activities on this network CD-ROM are interactive versions of those that appear in the Pupil's Book, allowing the pupils to complete tasks on-screen whilst using the activity book as a point of reference. 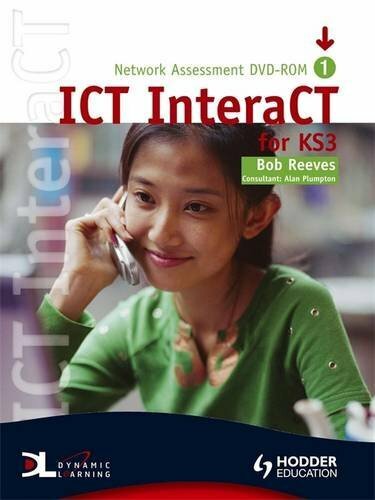 The CD-ROM also features activities that can be printed out and used with pupils when the IT suite is not available, reinforcing knowledge and understanding.Additionally, this network CD-ROM features: - editable teacher's notes and answers to the pupil's worksheets; - whole-class introductions to modules and units; - animated case studies; - interactive skills tutorials; - on-screen pupil assessments; - a marking and reporting tool for teachers; - resources such as sound, video and image files. Bob Reeves is a highly experienced ICT teacher / consultant who has wide-ranging experience of assessment of ICT at Key Stage 3.